Spanning a course of over 300 years (1277–early 1600s) and encompassing a legacy of no fewer than 50 Popes (Pope Nicholas III–Clement VIII), Art of Renaissance Rome provides a narrow cross-section (Artists and Patrons in the Eternal City) description of this intense period of art history. Third in the publisher’s series on Renaissance Art, it follows Renaissance Art in Venice: From Tradition to Individualism (2016) by Tom Nichols and Italian Renaissance Courts: Art, Pleasure and Power (2016) by Alison Cole, with the intention of delivering more sustained analysis in manageable bite-sized editions. The Forum, Pantheon, and Colosseum pre-date the time frame while the Vatican, Piazza Navona, Trevi Fountain, and the Spanish Steps were all products of the subsequent Baroque era. Rome, Eternal City it may be, could hardly keep pace with itself as it was constantly adapting and incorporating in a frenetic manic-depressive cycle. Barely establishing the preferences of one influence on an inhale when it is whipped in a different direction of influence on the exhale. While this makes for an entertaining “Wild Toad” ride, it can be tricky to keep track of who is demanding what, when, where, why, how. At first this project is a typical art history guide. It credits architecture as the source of artistic ideas/ideals before venturing into sculpture and painting as the lesser art forms that were required to adapt to the cutting edge developments of building. But this approach is quickly shifted from art history toward the broader artistic history of the city of Rome itself. Art, expressed in architecture, sculpture, painting, etc., was the tool with which powerful individuals wielded their power and positioned their egos. As power and influence waxed and waned between the Church of the Popes, the States of the Kings, and the Wealth of the Aristocrats, so too did artistic ideology vacillate between divine spiritual representation and the creative force of humanity on earth. Heresy was declared on a daily basis in the midst of technological developments in the arts and sciences. Each pope, in turn, could never really be certain which side was de mode, which was a safer bet, which deemed higher authority and declared importance. Most popes also had a surprisingly brief amount of time within which to exercise their decrees . . . sometimes less than one year which is hardly a span of time to make any lasting impact. Rome boomed or busted depending on which platform was selected. It’s fate held precariously in the hands of a few mighty decision-makers, determined by their tenure in office. This book is neither an exhaustive detail of the history of the papacy and patrons, nor is it an in depth scholarship about any particular Renaissance artist. 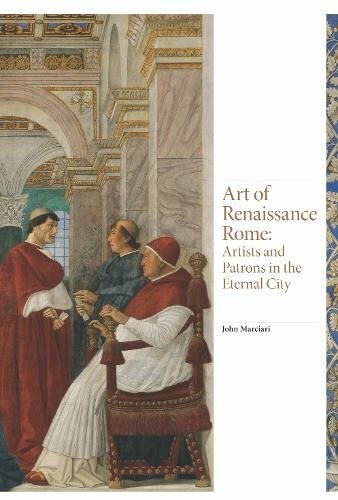 Rather, it is a narrative that elaborates on the interplay between the reliance of artist upon patron and vice versa, and the impact this complex relationship had on the development of Rome, the city where it all played out.